About The Boghe: Italian, part of Twothings, working in Milan and New York, amongst other exhibitions in the GEM in Den Haag (NL), Botanique (B), Heliumspacecowboy (GER). About Morcky: Italian, part of Twothings, executive board member of the Mikosa Foundation, amongst other exhibitions in Kuala Lumpur (MAL) and NoNewEnemies Gallery in Bruxelles (B). About Wayne Horse: German, former Gerrit Rietveld student, works with a variety of media, graffiti in pop culture, 16mm-short-movie “Elephant Boy”. About Zedz: Dutch, former Gerrit Reitveld student, 3D graffiti based artist based on very legibel typography isometric perspective, exposed at the GEM in Den Haag. About The London Police: British, infamous for his lad character, spreading joy and love through pencils and stickers, also known for his large mural paintings. About LordH: Italian, upcoming graffiti artist and Mikosa Board member, web illustrator, several expositions in the Netherlands. 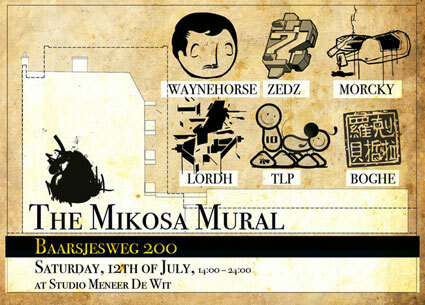 Make sure to be there, because in a few weeks time the whole mural sight will vanish behind a new building that will be build up right on the spot.